For thousands of years, mushrooms have been a coveted culinary prize, for which people would forage the woods just to get a basketful. It is said that the Japanese have traveled hundreds of miles to find wild mushrooms that only grow on very old plum trees. The ancient Greeks and Romans enjoyed eating wild mushrooms. Hippocrates, the Greek physician, used them for both food and medicine. Even Athenaeus, the Roman gastronomic author, wrote that mushrooms were "good for the stomach and pass easily through bowels and are very nutritious." 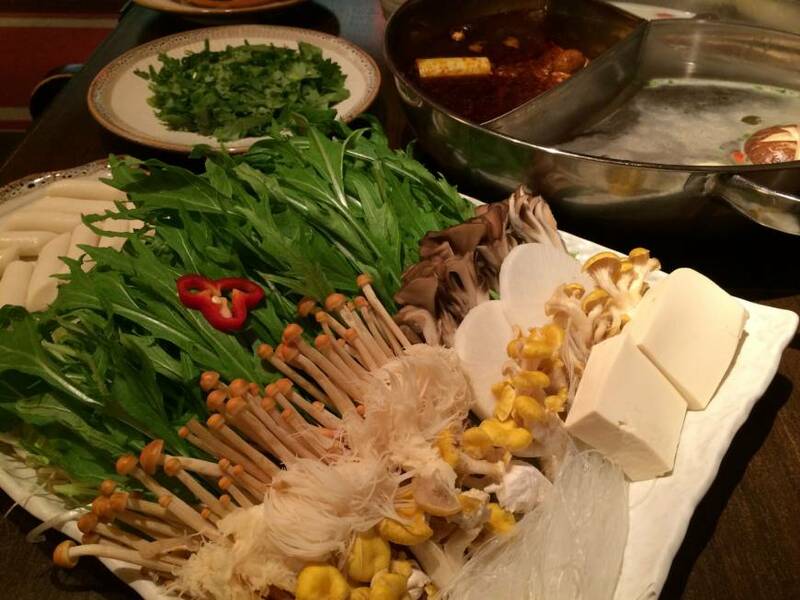 For all intents and purposes, mushrooms are classified in culinary terms as vegetables. But, in fact, they are not vegetables. They are fungi. And for that reason, people often succumb to what has been called "fungophobia," the fear of mushrooms. But rather than fearing mushrooms, people should be embracing them for their medicinal qualitites. As far back as 3,000 years ago, the Chinese were using mushrooms for general health tonics and to improve the immune system. Today in Japan, you can still find pushcart vendors selling mushrooms to people who believe that they help maintain overall health and promote longevity. The Aztecs and other Native peoples of North and South America, as well as other parts of the world (such as the Yoruba of southwestern Nigeria) used mushrooms medicinally and used hallucinogenic mushrooms ("magic mushrooms") for rituals and spiritual quests. Mushrooms were often part of the cultural mythology of so-called primitive peoples. Evidently, they were on to something because we know today that mushrooms are medical wonders. Mushrooms, in general, contain iron, niacin, copper, riboflavin, fiber, some B vitamins, and pantothenate. 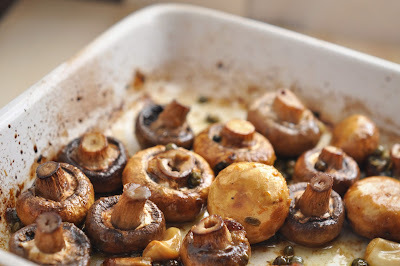 Because they are fat-free and low in calories, mushrooms are relied upon as a great diet food, too. Most importantly, they contain phytochemicals, which are cancer-fighting agents. Mushrooms also help lower bad cholesterol, fight heart disease, boost immunity, improve liver function, and have even been known to relieve symptoms of Chronic Fatigue Syndrome and AIDS. Recent studies on particular types of mushrooms have revealed even more benefits of eating mushrooms. The following three types have been studied extensively, although more research is currently being done. 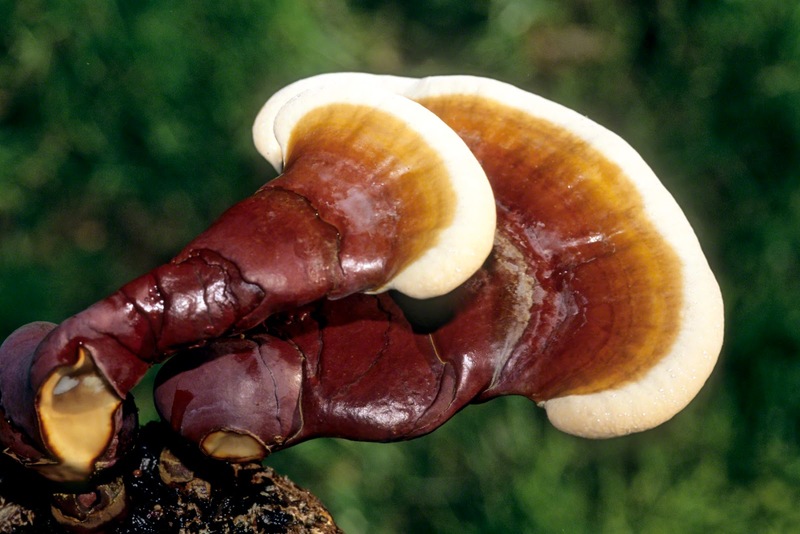 Since ancient times, the Chinese and Japanese have been using reishi mushrooms to treat diseases of the liver, arthritis, and high blood pressure, as well as other medical conditions. They seem to have antiallergic, anti-inflammatory, and antibacterial properties. In the 1970s, a scientific test was done on more than 2,000 Chinese patients suffering with chronic bronchitis. They were given reishi syrup tablets and 60 to 90 percent showed a significant improvement within two weeks. Maitake mushrooms have been shown to aid in the fight against specific cancers, namely, lung, stomach, and liver cancers and leukemia. Sixty-three Chinese patients with those types of cancers were given 4 capsules of maitake extract 3 times daily before meals for one to three months. This resulted in an "anticancer" effect in the patients. 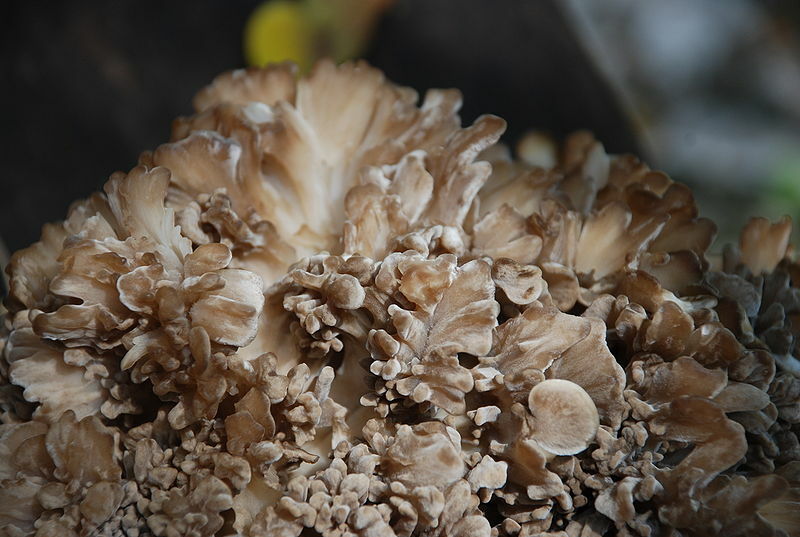 It is also possible that maitake may be helpful to AIDS patients suffering from Kaposi's sarcoma and other symptoms. Today, products created from mushrooms for health purposes (by both the traditional medical and alternative medical communities) are estimated at being worth more than 1.2 billion dollars every year. Mushrooms deteriorate very quickly. Some, like porcini, are so fragile that they must be eaten within a day or two of harvesting. So, the key to quality mushrooms is freshness. Whatever type you are purchasing, look for ones that do not have bruises, slime, brown/black spots, mold, or any other signs of deterioration. Familiarize yourself with the colors of the different types and look for good coloration. If the mushrooms have gills, they should be fresh-looking and upright. While mushrooms are being hailed for their anticancer properties, be aware that non-organic, store-bought mushrooms may increase the incidence of cancer because cultivated mushrooms are among the most heavily pesticide-sprayed items on the market. So, if you eat large quantities of mushrooms (or even if you eat small quantities), your best bet is to shop in the organic section or in pesticide-free farmer's markets. The proper way to clean mushrooms is to wipe them with a paper towel or brush them with a "mushroom brush," a small brush invented for the sole purpose of cleaning mushrooms. Mushrooms are notorious for soaking up water, so you want to avoid water-logging them. However, I am paranoid about getting grit in my food, so I dip them quickly under cool running water and find that it does not adversely affect them. If the caps are particularly dirty or discolored, you can peel them by pulling on the upper layer of skin with a small knife. The stems of mushrooms can be eaten, but some (like the stems of portobellos) are tough and should be removed. There are some 38,000 mushroom varieties (mostly wild) throughout the world, of which only about 250 to 300 are edible; most of the others are toxic. (In France, when people have picked wild mushrooms, they bring them to local pharmacies to have the toxic ones identified. The pharmacists sprinkle salt on the gills and if they turn yellow, they are toxic.) In the U.S., some can be gotten fresh, while others can only be found dried, depending on regional availability. 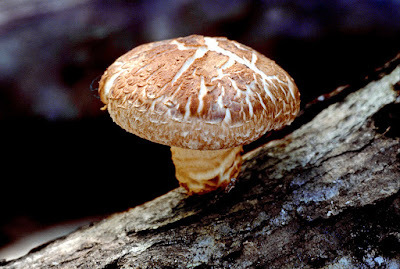 Among the more popular mushrooms, and those increasing in popularity, are button or white; cremini (which start out as button); portobellos (which are the more mature versions of cremini); porcini; morel; chanterelles; lobster; enoki; matsutake; wood ear (also known as black fungus); shiitake; honey fungus (also known as honeycomb); jelly fungus (also known as white ear); reishi; maitake; Swiss browns (also known as gourmet browns); and oyster (also known as phoenix tail, abalone, and pleurotte). 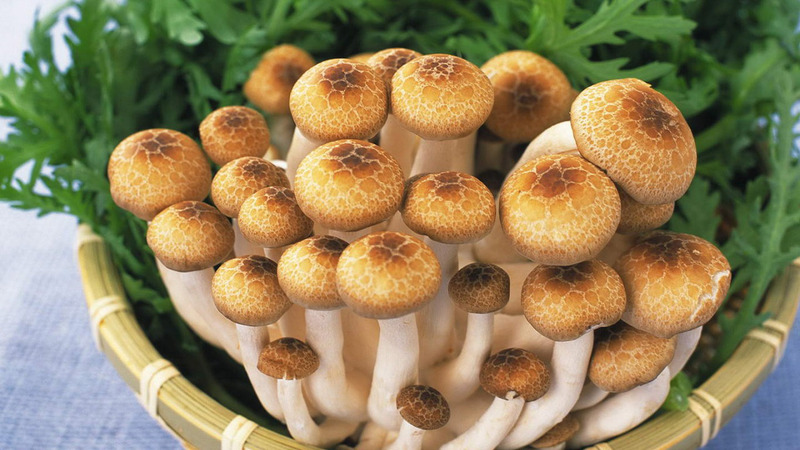 Throughout history, mushrooms have been thought to have magical powers. In some parts of the world, it is believed that circles of mushrooms, called "faery rings," sprout during the night in woods and fields. Some people believe that thunder causes new crops of mushrooms to grow. Our word "mushroom" comes from an Englishman mispronouncing the French name, mousseron (moo-seron) as muscheron (moosh-eron), and this eventually became mushroom. The Latin root word is mussirio—a word for something that grows rapidly, which mushrooms surely do. Below are a couple of recipes—great ways to incorporate magical (not "magic"!) mushrooms into your diet.